The Alburgh Vol. Fire Dept. 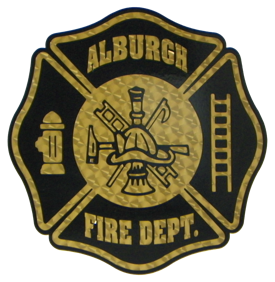 is an all volunteer, non-profit organization whose primary goal is to provide Fire, EMS, Marine Rescue, Heavy Rescue, and HazMat Operations coverage to the residents of Alburgh in a safe and professional manner. AVFD also provides ambulance services to the residents of Alburgh and Isle LaMotte. For both Fire and Ambulance we also provide Mutual Aid to our neighbors in surrounding towns in Vermont, New York, and Canada. The organization has been in operation since it was chartered in 1968. AVFD is unique in that it is not a municipally owned organization but is owned and operated by the AVFD members. The AVFD is a member of the Grand Isle County Mutual Aid Association (VT) as well as the Clinton County Mutual aid Association (NY). We host the annual North Country International Fire Training School every June and we support our community with school presentations, 911 house numbers, Knox Box installation, and CPR and First Aid classes. AVFD is always looking for volunteers and we will provide free training! If you would like to come check us out and see what we are all about, click on ABOUT US tab to see our training schedule. All are welcome to stop by. If finances are tight the American Red Cross offer Free Smoke Alarms Installed in your home! during the 10 year life of the smoke alarm. we will return your call. Or send an email to: angela.robinson@redcross.org .